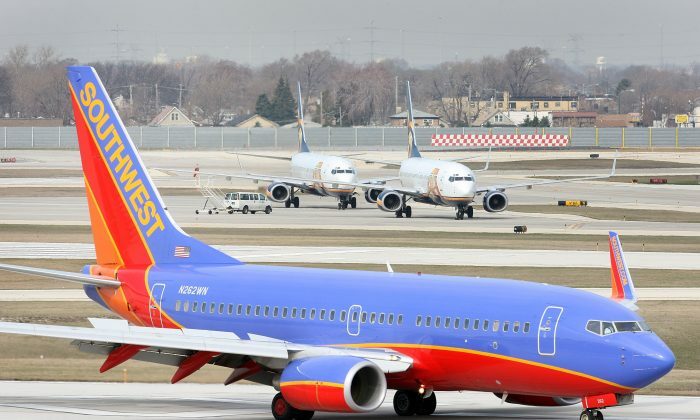 A man was removed from a Southwest Airlines flight earlier this month after another passenger heard him speaking Arabic and believed that it expressed a threatening message. Makhzoomi was slated to fly from Los Angeles to Oakland and return to classes on April 6. According to Khairuldeen Makhzoomi, who was removed from the flight and then interrogated by an FBI officer, he said “inshallah,” a common phrase that means, “if God is willing.” A female passenger had heard “Shahid,” which means martyr, and has a jihadist subtext. “At the end of my call I said, ‘Inshallah, I will call you,’ and he was like, ‘Call me when you get home.’ I was like ‘Inshallah, Inshallah,'” Makhzoomi elaborated to NBC Bay Area. “She kept staring at me and I didn’t know what was wrong,” he told the Daily Californian. He was then escorted off the plane, and then was patted down and had his bags searched by the FBI. He was told he couldn’t return to the flight, and was given a refund by Southwest. The story has unleashed public backlash against Southwest Airlines, who is being accused of discrimination against Muslims. Makhzoomi was born in Iraq, and his family immigrated to the United States in 2002. According to NBC Bay Area, his father, an Iraqi diplomat, was killed under Saddam Hussein’s regime. He is a senior at UC Berkeley. Southwest said that the crew had decided to investigate “potentially threatening comments” on that flight, and apologized for the incident. “She was crying in front of everybody,” he said. “They ignored me,” Abukar added.